I can’t tell you what motivated many Americans to commemorate the life of Saint Patrick by embarking on a day-long drinking spree, dashing from bar to bar and downing just as much alcohol as they think they can handle without hurling in the streets, covered in green from sweatbands to beads to jerseys, as if binge-drinking were a recognized endurance sport. I also can’t tell you why even more Americans insist that a proper St. Patrick’s Day meal must revolve around corned beef—a meat that is not, in the least bit, historically Irish—when in Ireland they’re actually much more likely to enjoy ham, bacon, or lamb on March 17th. I can’t tell you why, but what I can tell you is that I love these traditional spin-offs, and I will be partaking in them along with the majority of the rest of the country this upcoming weekend. Saint Patrick’s Day isn’t until Sunday, but I’m making my corned beef on Friday night. Why? Because I’m a rebel fighter, and I won’t let the man tell me when to make my corned beef! Wait– no, no. 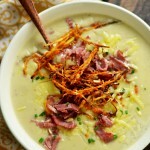 Because I want to eat leftover corned beef all weekend! 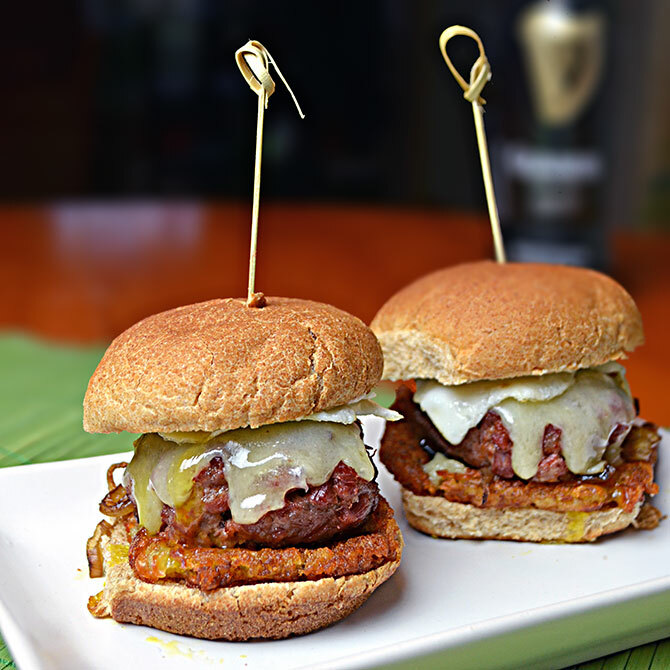 Well, yes, but… Because I need to have these Corned Beef Hash Sliders for Sunday brunch to soothe the destruction done to my body and soul after a Saturday filled with pre-St. Paddy’s Day drinking! There we go. That’s planning ahead, for you. Don’t get me wrong, I won’t be one of the girls doubled over and crying on the sidewalk with elastic waistband green short shorts on, but I’m anticipating that my lady-like drinking habits might fall a bit wayside and my liver might not appreciate it. I’m sure you understand. 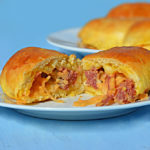 We all have days like that, but luckily, we now have a recipe for the absolute best hangover breakfast ever invented. By the way, let me just make it clear that you don’t have to have a hangover to eat this glorious meal (in fact, to ensure that you don’t suffer through one, take 2 aspirin and drink a bottle of water before bed). When I made the test version pictured below, I had enjoyed a very sober week. 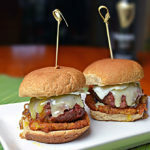 I served a few sliders each to my brother, who doesn’t drink, my mother, and two of my friends. Super sober consensus: these are amazing. 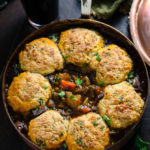 These would also make fantastic appetizers for a St. Patrick’s Day party. However, if you’re not serving them immediately after cooking, I’d skip the egg and add a little extra Horseradish Spread to the bottom bun. 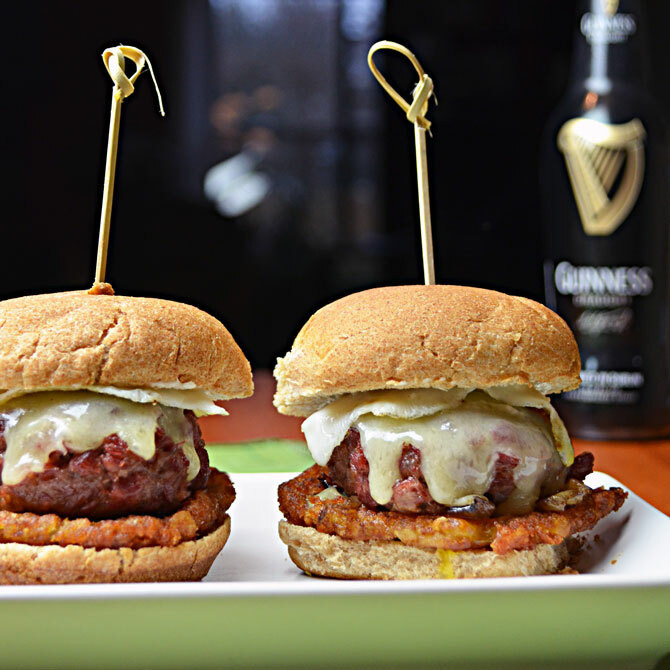 Corned Beef Burgers, Hash Brown Patties, Guinness Caramelized Onions, Irish White Cheddar, Quail Egg, and Horseradish Spread, all on a mini slider roll? I’ll take 7, please. Cook the hash brown patties according to the directions on the packaging, except mash them down a bit with a spatula to create a thinner, crispier layer of hash brown. As the hash brown patties cook, start the corned beef burgers. In a medium sized bowl, combine the leftover corned beef and ground beef using your hands. It will take some work to get the corned beef to all stay together with the ground beef, but keep combining and it will get there. Add in the peppers and salt, and continue to use your hands to mix. When everything is well-combined, form 12 small patties out of the meat. Each patty should be slightly wider than one of the slider rolls. Set aside. Warm oil in a large pan over medium heat, and add the onions, stirring occasionally until cooked through, about 5 minutes. Add about a third of the Guinness, and stir the onions. Cover the pan until most of the liquid has been absorbed, and repeat until there is no beer left. Then, add the Worcestershire sauce and Dijon mustard, and stir. Remove the onions from the pan and set aside. In the same pan, fry the burgers until cooked through, about 4 minutes on each side. 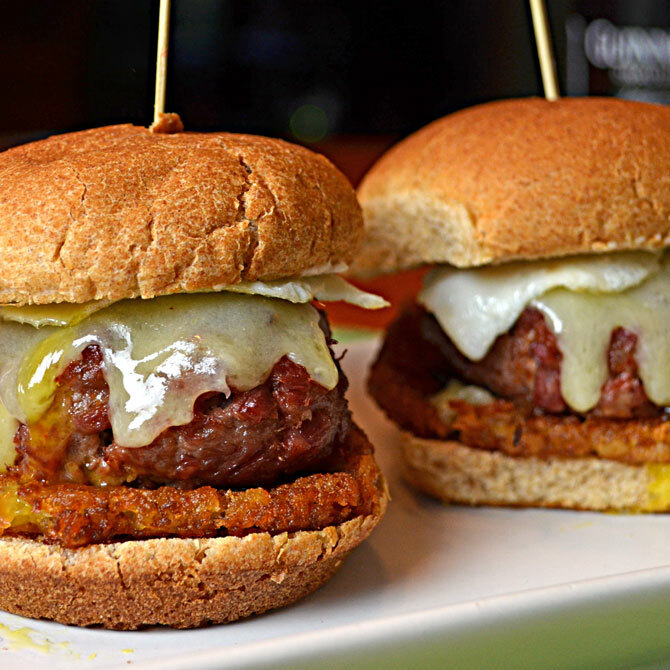 Layer the slider buns with one half hash brown patty, a few caramelized onions, one Corned Beef Burger, and a 1-2 small slices of the Irish white cheddar. 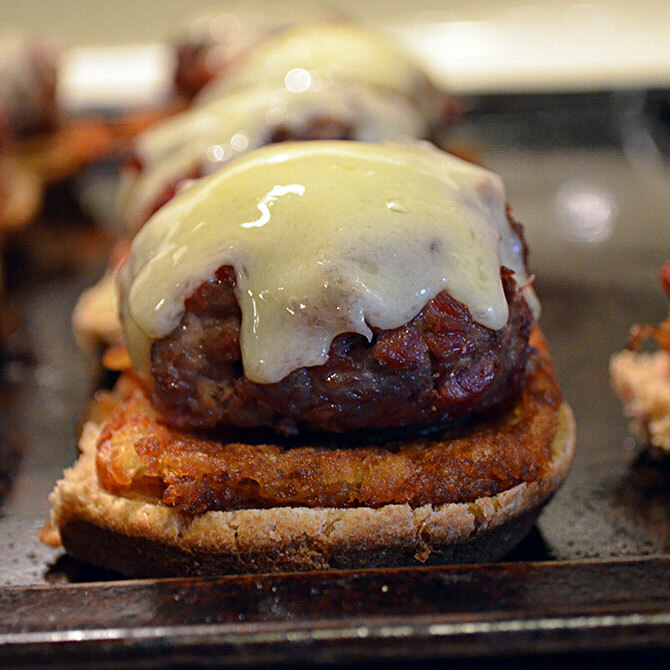 Place the sliders on a lightly sprayed nonstick baking sheet and cook on low broil for just a few minutes, until the cheese is melted. As the cheese melts, mix together the prepared horseradish and mayonnaise in a small bowl to create the Horseradish Spread and set aside. Cook the eggs as desired. In the picture, I made the eggs sunny side up, which simply requires that you crack the eggs over a large pan sprayed with nonstick spray, letting the white out to cook for a few seconds before pouring the intact yolk on top (to ensure that the yolk doesn’t slide off of the whites). However, any egg style will work with these sliders. You can substitute chicken eggs if you’d like, and make them scrambled-style so that they can be layered easily on top of the sliders. 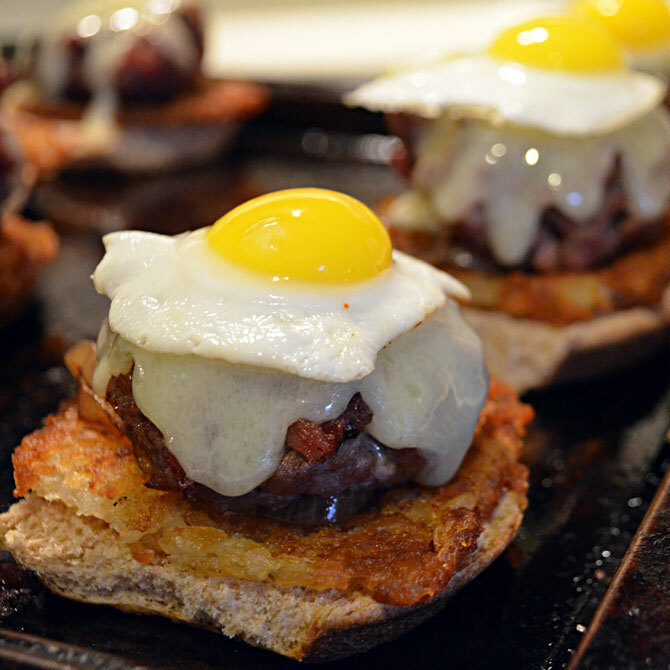 Add the eggs on top of the sliders. Spread each top bun generously with the Horseradish Spread and place on top of the slider to finish it. Use toothpicks, cocktail picks, or bamboo skewers to keep the sandwiches together. Serve warm. ** If you’d like, you can make your own hash browns. I find that using pre-made ones cuts down the time by a lot, and I don’t like waiting too long for my brunch. However, it’s up to you. By the way, to see more photos of the process, follow @hostthetoast on instagram (or twitter, I post most of the pictures to twitter as well). 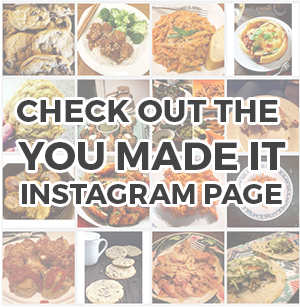 When you follow, you’ll get to see in advance the “behind the blog” photos of what recipes will be coming soon! Just revisiting this post makes my mouth water. 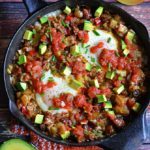 One of my favorite recipes you’ve made thus far… The fact I ate half of them has to say something too. Please use a larger font. Almost impossible to read. For some reason this page will not enlarge on my computer. The recipe looks great. Thanks for posting. Mary here.